Nettle & Pea Shoot Soup – Dig Delve – An online magazine about gardens, landscape, growing & making. 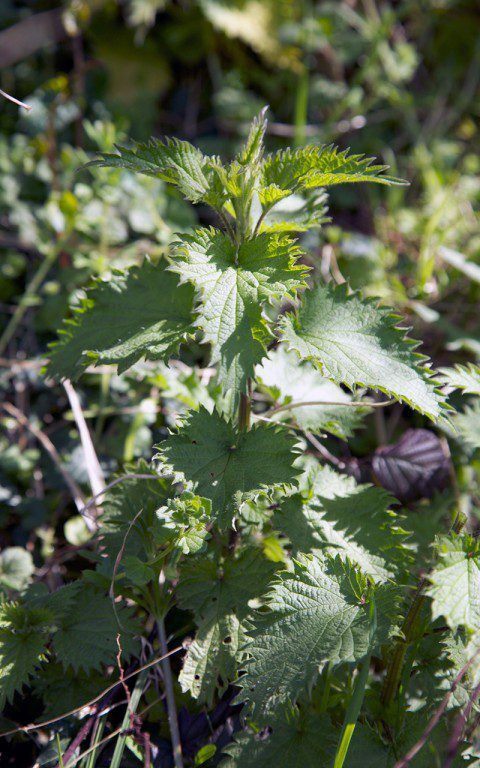 Stinging nettles are some of the first plants to appear in the hedgerows and fields in early spring along with the wild garlic. They are colonisers of wasteland, verges and streambanks, thriving in rich, disturbed soil. Some of our biggest patches grow on the sites of last year’s mole-hills and where the sheep had their midden. Nettles have a bad reputation with gardeners due to their propensity to spread. However, they are the primary food source for the caterpillars of a large number of moths and butterflies, including the comma, small tortoiseshell and peacock, and in autumn provide plentiful seed for birds, so we scythe or strim only the worst patches to keep them in check. 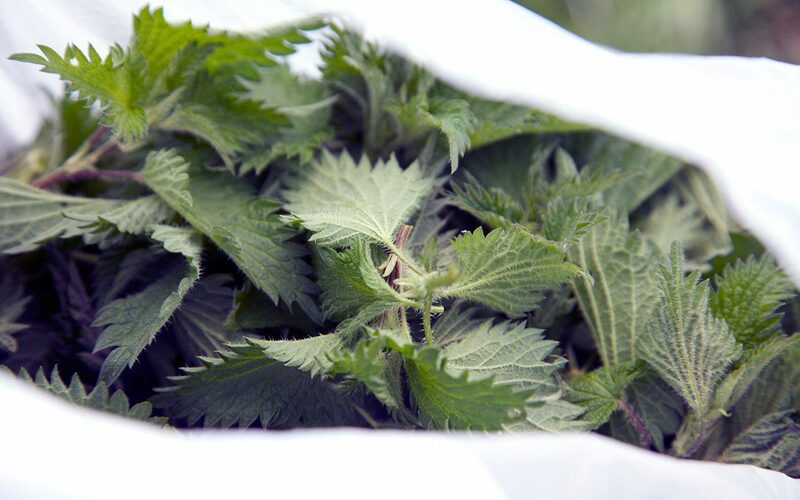 Despite the challenges of gathering nettles, as long as you have a pair of impenetrable gloves and long sleeves, you can pick enough nettle tops for soup in just a few minutes. You only want the very tip of the plant, comprising the first two leaves, the larger two below and the tender stalk connecting them. Anything beneath will be tough and fibrous. Indeed, before the introduction of flax to Britain, nettle stalks were used to produce a type of linen and rope. Nettle tea has been long used as a blood purifier and general cure-all, and they are an excellent source of potassium, phosphorus, sulphur, sodium, chlorine, and vitamins A and C.
You should take care where you gather your nettles. Never from roadside verges or where dogs might pass and, if foraging in the city, parks, cemeteries and wasteland away from major roads are best. Nettles have a metallic flavour all their own, but with something of the ferrous quality of watercress and the astringency of spinach. The simplest soup recipes call for nothing more than onion, potato and nettles, but this has little depth and the tannic nettle can dominate. The addition of carrot and celeriac sweetens the stock base, while the earthiness of pea shoots balances the nettles’ tannins. It seems only natural to pair nettles with wild garlic, but if added directly to the soup the garlic overwhelms. Combined with crème fraiche it provides a spicy contrast of flavour. For the freshest spring green soup it is essential to only wilt the nettles and pea shoots in the hot stock before blending. Overcooking turns the soup an unpalatable brackish shade. For the same reason this soup should be served as soon as it is made. If you must prepare it in advance chill it rapidly immediately it is done and then reheat at the lowest possible temperature, keeping a constant eye on it to ensure it doesn’t boil. Warm a large pot over a low heat and melt the butter. Add the leek, potato, carrot and celeriac. Put a tight lid on the pan and sweat the vegetables slowly until the leek is translucent, and the roots start to soften. Don’t allow them to colour. Add a spoonful of water if you fear they may catch. Add the vegetable stock or water and bring to a simmer. Cook on the lowest heat until the vegetables are soft. While the vegetables are cooking make the wild garlic cream by blending the wild garlic and crème fraiche with a stick blender. Alternatively finely chop the garlic leaves and stir into the cream. Season to taste with salt and put to one side. 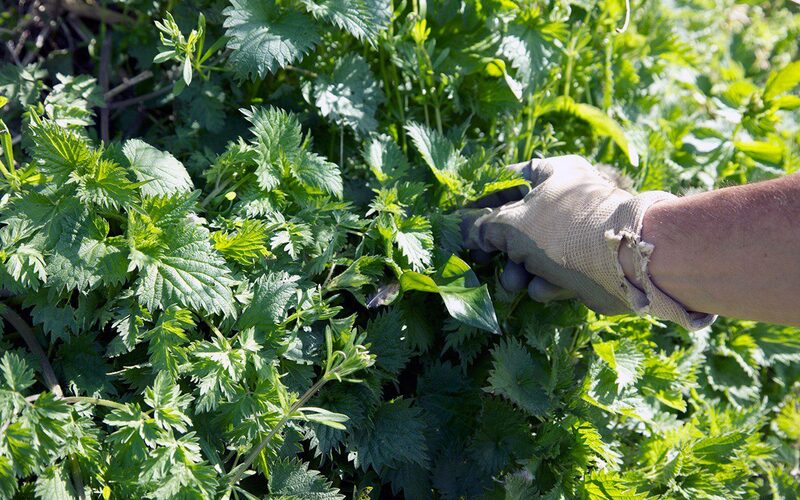 Wash and pick over the nettle tops, removing any leaves and stalks that look tough. Take the vegetables and stock from the heat. Add the nettle tops and pea shoots. Stir and leave for a moment until the leaves wilt. Liquidise the soup and ladle immediately into warmed bowls. 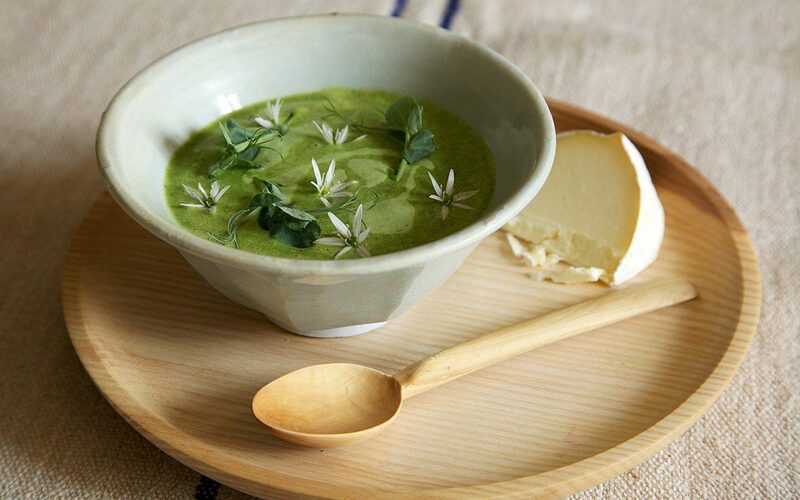 Spoon some of the garlic cream onto the soup and garnish with a few wild garlic flowers and pea shoots. Serve with crusty bread and a young white cheese. Cornish Yarg, which is itself wrapped in nettle leaves, is a perfect match. Gorwydd Caerphilly or Sharpham Rustic are excellent alternatives.